Mayor Mike Bloomberg & Kevin Fitzpatrick. Photo credit: Bloomberg Philanthropies. GovernorsIslandGuide.com is devoted to publishing news, features, and history stories about the Island in New York Harbor. It is based on the 144-page book by Kevin C. Fitzpatrick, The Governors Island Explorer’s Guide (Globe Pequot Press, 2016). This is the first–and only–guide book to the Island. It was nominated for an Apple Award by the Guides Association of New York City for Outstanding Non-Fiction New York Book. Kevin has been leading tours of the Island since 2006. GovernorsIslandGuide.com is not affiliated with the Trust For Governors Island. 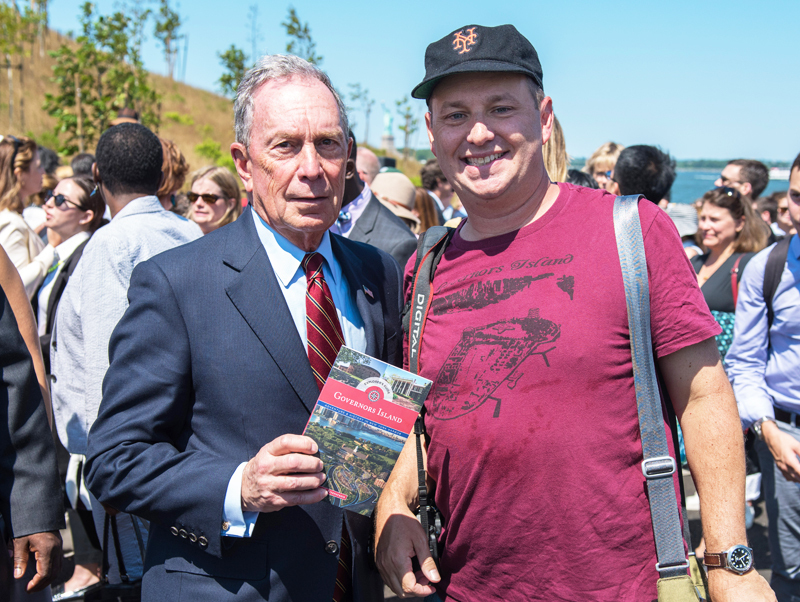 The site launched in 2006 and all content is devoted to Governors Island news and features. All book information is here. Since 1999 Fitzpatrick has been leading walking tours of New York. He is a licensed New York City Sightseeing Guide. He conducts public and private walks throughout the year. Tour information is on Big Apple Fanatics Tours. Kevin served in the U.S. Marine Corps Reserve from 1984-1989. He was honorably discharged and served on the east and west coasts as a writer and photographer for USMC public affairs offices. Kevin is a graduate of Northeast Missouri State University with a BA in mass communications. He started his career in newspapers in Missouri, and this led him to New York. For his work on his books and projects, he’s been reviewed in the New York Times, USA Today, National Geographic Traveller, the LA Times, Vogue online, and many others. He’s been a guest on BBC Radio and NPR. Fitzpatrick is a member of The Lambs and the Guides Association of New York City. He resides in Manhattan.